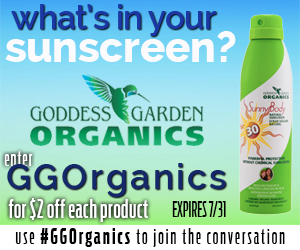 This Goddess Garden sunscreen review is sponsored by Green Sisterhood. All opinions are my own. 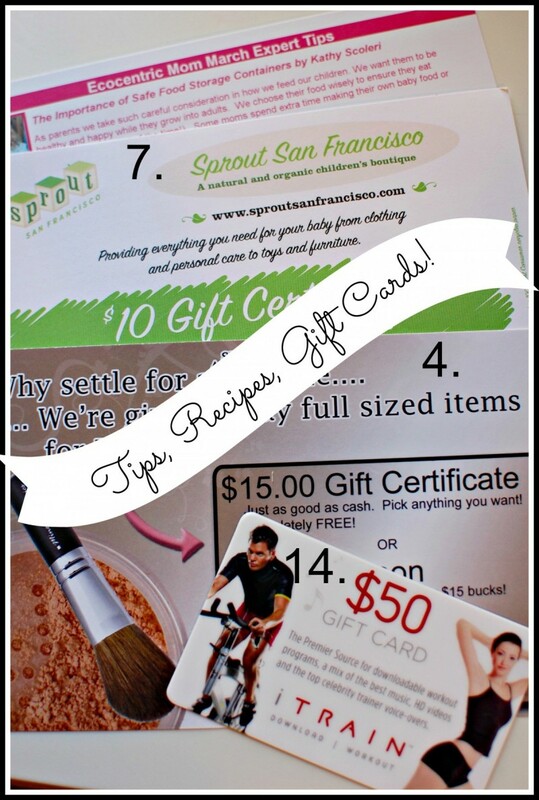 Friends, I am so excited to share this product review with you. I’ve loved Goddess Garden Organics for a long time (I’ve mentioned their sunscreen as a Safer Summer Essential item, and as the perfect travel sunscreen). However, I hadn’t tried ALL of the products from Goddess Garden, and when I did, I found two products that are now part of my daily repertoire. I live in the Southwest, in Northern New Mexico, where it’s sunny at least 300 days per year. We’re in a high desert climate, where we get four seasons, we get snow, we get wind, we get monsoons. Through it all, though, the sun will appear at some point during the day. Tourist brochures warn about the intensity of the sun, and those who did not heed the warnings sport the common signs of sun damage: excessive wrinkles, age spots, and drooping skin. Do You Understand the Effects of the Sun? We learn a quick lesson when we aren’t prepared–especially when the Earth tips toward spring. On the first warm day of the season, I got a sunburn while standing outside for 10 minutes talking to a neighbor. Despite wearing a hat, my little guy came home with a pink nose after playing outside at school. We now make sunscreen part of our routine! Goddess Garden’s line of sunscreens include three products which make it easy to protect skin on the daily: Sunny Face facial sunscreen, Daily Lotion, and Sunny Body Continuous Sport Spray. Moisturizing ingredients and Helichrysum Italicum (Immortelle) Oil pamper the skin and repair past damage, while zinc oxide protects, making this the perfect regular facial moisturizer. Goddess Garden manages to create a formula that magically disappears upon application (see my video below!). Make this the first product you use daily, and Sunny Face has your skin covered before you even walk out the door. Goddess Garden’s Daily Lotion boasts an SPF 15, so you can moisturize and protect all at once. My only complaint is the that scent is so light it is almost nonexistent. Like Sunny Face, the formula doesn’t leave a white film–just apply and go. I love when I don’t have to think about it! My entire family used the Goddess Garden Sunny Body Continuous Spray last summer. I never understood how convenient spray sunscreen could be until I had a VERY active 3-year-old escaping my clutches enjoying the sand and sea! The Sport version is even more beneficial: it’s water-resistant up to 80 minutes, so I know we’re protected through sweat and swimming. The continuous spray is so simple and quick, and one bottle lasts quite awhile since a little goes a long way. The Sport Spray is unscented. A Note from Goddess Garden re: EWG ratings: “…our sprays (both trigger and continuous sprays) have an EWG rating of 3 instead of 1 like the rest of our sunscreens. The only actual difference between our continuous spray and our traditional lotion is that the sprays don’t have Shea butter. Other than that, the ingredient list is exactly the same. The EWG is concerned about inhalation of airborne particles—namely zinc and titanium. … The zinc and titanium that we use in our sprays is actually the EXACT SAME NON-NANO zinc and titanium that we use in our lotions. The average particle size is 120nm. The range in particle sizes is 100nm to 130nm. Most definitions of “nano-particles” are under 100nm.” Healthful Mama says: Just don’t spray sunscreen on faces (put it in hands first) and you’ll be fine. The EWG seems a bit harsh in this regard. Watch the video below to see how I use Sunny Face & Daily Lotion in my beauty routine. 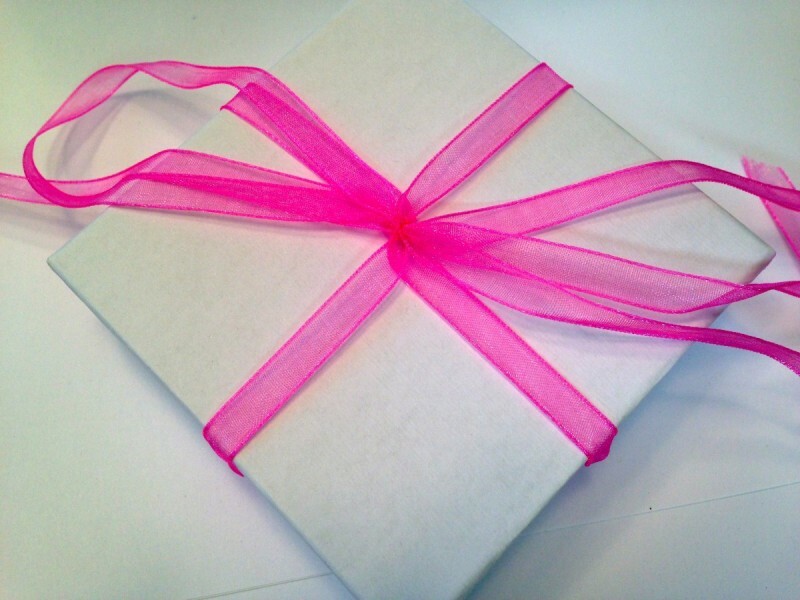 Two elements which are of the utmost importance to me in a product: quality and value. 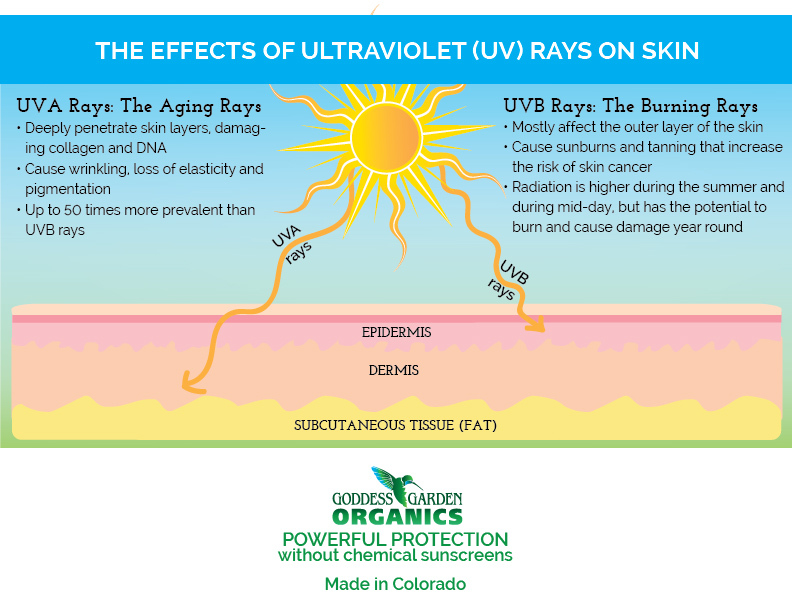 When we’re talking about non-toxic sunscreen, I want a product made of the safest ingredients that also goes the distance. 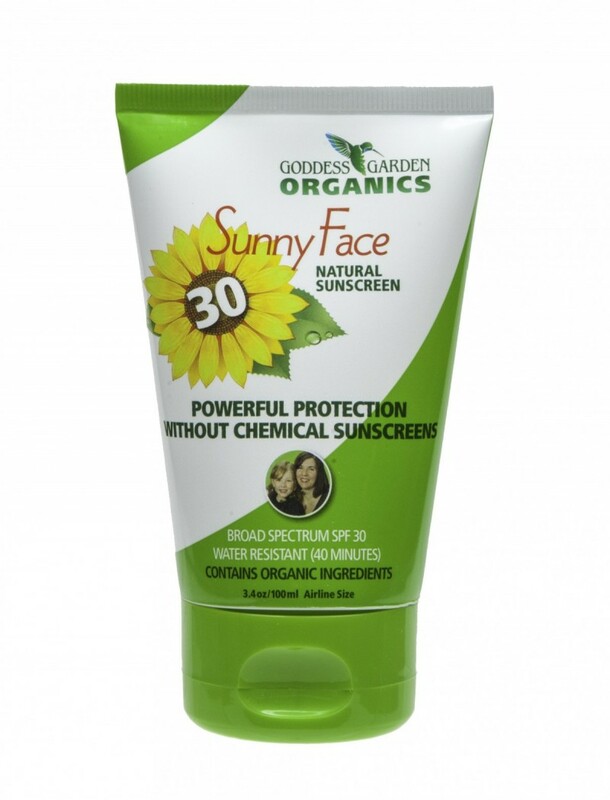 Goddess Garden Organics provides natural sunscreens that do double-duty: they protect skin while also caring for it. The formulations are wonderfully moisturizing and disappear quickly on skin, providing a simple solution to the question of “moisturizer or sunscreen?” Goddess Garden Organics products are a great value, too, as each bottle, spray, or tube lasts quite some time. A little goes a long way. 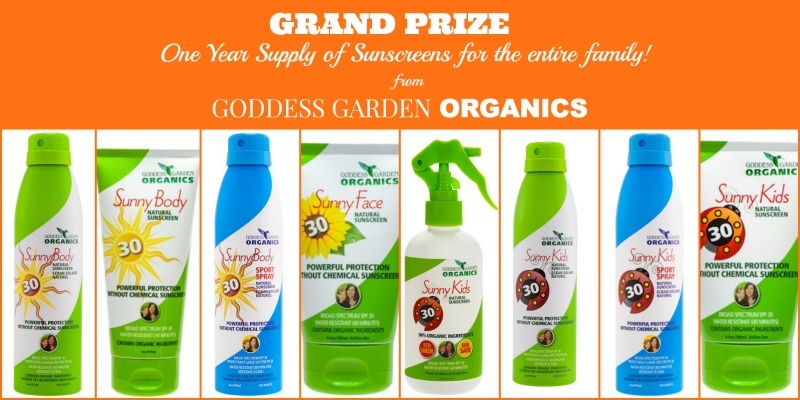 Win a year’s supply of sunscreen! Enter below. I’d love to try the spray sunscreen. We currently use a pump but the spray would be so much better. Have started using this brand on the kids and love it – bonus, its the only spray of any kind I could find that did not contain chemical sunscreens as well. I’d love to try this.http://shop.goddessgarden.com/natural-daily-lotion-grapefruit-bergamot/ I love bergamot. 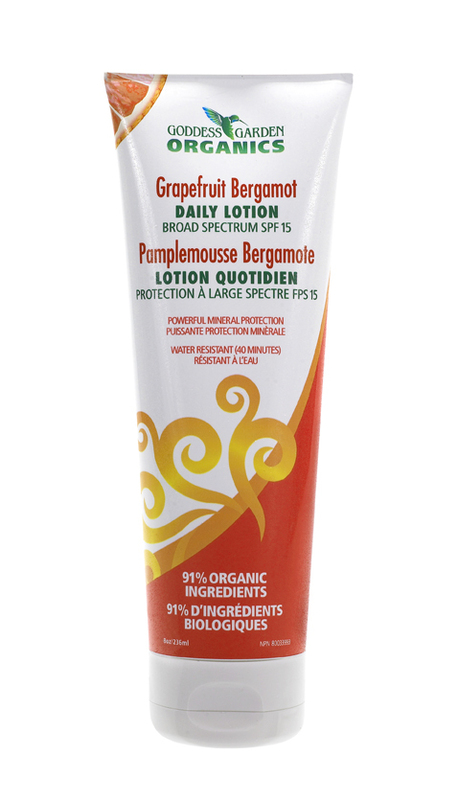 I would like to try the Natural Daily Lotion – Grapefruit Bergamot! Are these products safe to use on cats/dogs as well? I have a brand I use now that’s organic but it contains a low level of zinc which is higher concentrations can be toxic if absorbed. 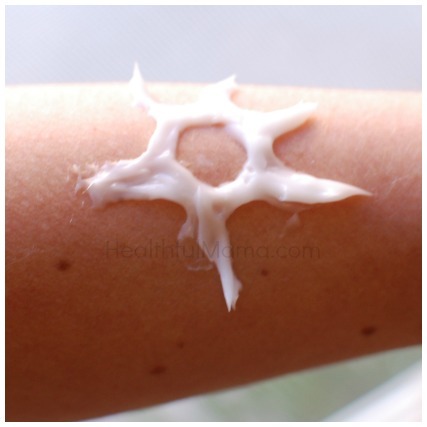 It’s topical sunblock that doesn’t penetrate the skin. Thanks so much for these recommendations and reviews. I hadn’t heard of any of these yet. I can’t wait to try them out on my little one. The whole sunscreen is completely ridiculous in my opinion. Half the chemicals they put in them these days actually cancer? Just let that sink in for a moment.. They actually ’cause’ cancer. A good organic sunscreen with zinc oxide will keep you safe. I’ve heard titanium dioxide is not so good..